This article was published in today's Age newspaper. We don’t switch to reality television when we want to expand our minds, but their frivolous pleasures do not mean that these shows are beyond criticism and public debate. In the past week, the teaser promotion for the new series of MasterChef Australia has drawn international attention for its sexism. The offending ad pitches the upcoming series of the cooking program as a battle of a sexes, with the infantilising title of “Boys vs Girls”. The contestants are segregated on pastel gender lines with the women wearing pink and the men blue. A volley of stereotypes relating to women’s and men’s respective abilities are traded as the teams trash talk. Women are “better at presentation”, for instance, because they’re “used to grooming” themselves. While the quality that “all the top chefs in the world” share is that “they’re all men”. The women face off against the men raising their pink oven mitts like boxing gloves, while the men wield baguettes like batons. Yet the repeated national broadcast of limiting views that suggest women are naturally suited to tirelessly producing meals for the family while men are destined to elevate cooking to a sophisticated art form has been defended by some online commentators. Indeed, the counter-response to criticisms of the MasterChef ad shows just how complicated it has become to critique sexism in popular culture. 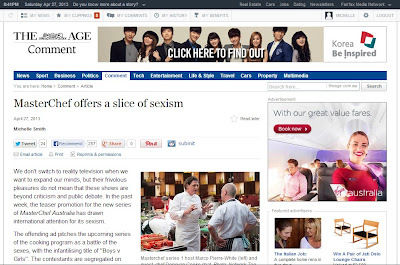 Another common argument, which has been used frequently in support of the MasterChef ad, is that sexism sometimes arrives in the form of harmless jokes. Maudlin feminists are simply barging in to interrupt good-natured humour as self-appointed fun police. 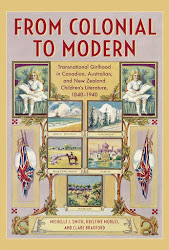 For those who subscribe to this view, there are innate gender differences that mean that men are incapable of doing two things at once (“A woman can multi-task”) and that women cannot complete most endeavours as well as a man (“When a man puts his mind to a job, it always turns out better”), and hilarity ensues from pointing out these fundamental truths. Nevertheless, it is crucial not to separate the worst outcomes of sexist societies, such as violence against women, from the cultural ideas we take for granted that support them. The widespread propagation of ideas that women are inherently inferior and are primarily valuable because of their appearance and ability to perform domestic work contributes to the existence of the “more important” problems confronting women. While we need to agitate for political change to continue the process of lobbying for substantive equality in the workplace, reproductive rights and protection from violence and poverty, these victories will only come alongside transformations in how men and women are understood by our society. This is not to say that MasterChef’s Stepford wives dancing with shopping trolleys have a direct impact on the treatment of women. Yet the continued acceptance of gender stereotypes as fact, and even as subjects of amusement, continues to imprint the belief that gender inequality is the result of natural differences rather than discrimination. An ad that was humorously playing with these stereotypes, rather than reinforcing them, might show a male contestant alongside a tiered stand of delicately iced cupcakes or would depict a woman bringing her tongs into the sacred realm of the masculine barbeque. Instead MasterChef gives us the uncomplicated view that biology determines whether we can bake or char-grill. The show promises entry into an industry in which the majority of chefs are male for various reasons, including the incompatibility of restaurant working hours with the family responsibilities that primarily fall to women. The male hosts and judges are the resident experts on the profession. One of the female contestants on the sexist ad spuriously claims that “the average woman cooks over 1,000 meals per year” in the home. Yet we understand that this kind of cooking is not regarded with the same esteem. Two of last year’s female “Professionals” contestants were repeatedly relegated to dessert duties, though they were not specialists in this area, while men took command of the mains, showing the entrenched view that a man’s work “always turns out better”. With real-world discrimination against women in professional kitchens, as in other prestigious male-dominated industries, MasterChef’s decision to exploit baseless gender stereotypes is thoughtless rather than entertaining.